This trail was established in the 90's, but has a history as long as the community that is all around it. The early 1900's brought a lot of people to the upper Stiliguamish River. Lime Kilns converted limestone to lime. The lime was transported on the railroad across the river to Everett and used to help melt ore. This trail is very easy for ages 4 or 5 and above. It does drop in elevation, so the only uphill is on the way back to your car. 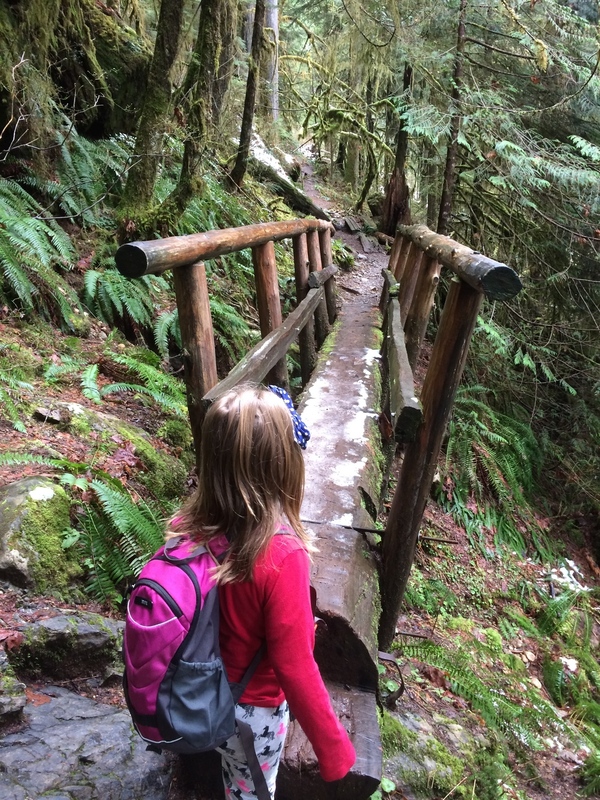 Bonus for the kids on this hike are the remnants of the kiln and the Stiliguamish River. Kids love water!! 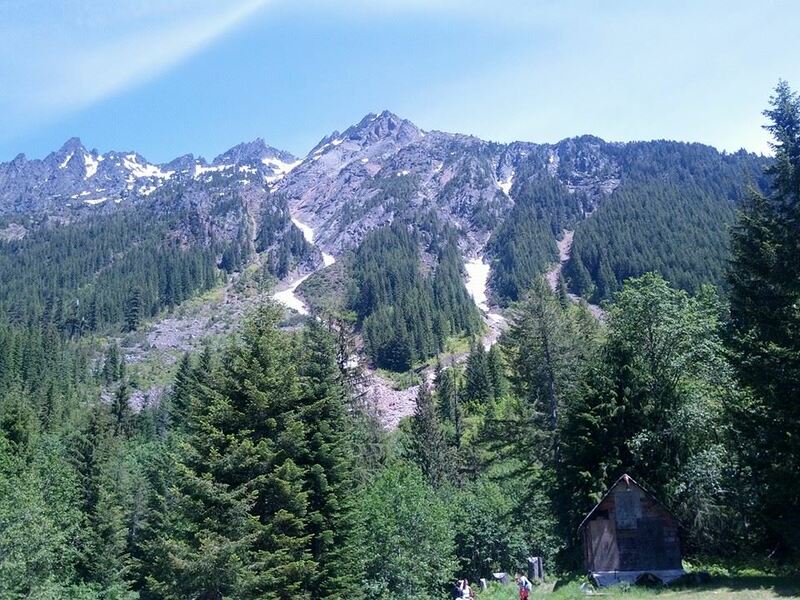 Get there: Go to Granite Falls, but this hike is not up the Mountain Loop. Drive to the eastside of ton by turning right on Alder Avenue. In about a half of a mile turn left on Menzel Lake Road and continue until a left hand turn on Waite Road. Follow this road until you pass a turn around area and stay left (uphill) until you see the white gate on the left. It's just before the road splits into two private roads. This trail has a lot of similarities to the Lime Kiln. The old railway is from the same time period and the trail itself only has uphill on the way out. I can actually remember hiking this trail as a very young kid myself - dreaming of the trains steaming through the forest into the gorge. 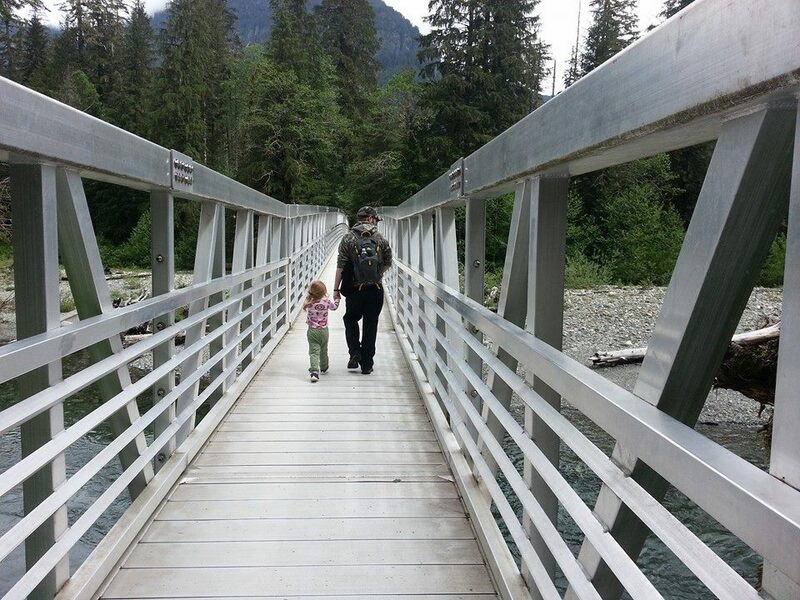 There are a couple of spots to easily find the Stiliguamish River and let your kids throw rocks or just listen to the water. There was a rock slide that makes it very unsafe for kids to continue past and unfortunately just misses the first of two abandoned railroad tunnels. This gorge in the Stiliguamish was once a very hard spot for the old railroad, and there used to be six tunnels in a short distance through this small canyon. The two tunnels on this trail are numbers six and five. The next tunnel, is no longer standing and the final tunnel that used to be accessible from this trail is mostly buried. There is also an bridge just before the final tunnel! 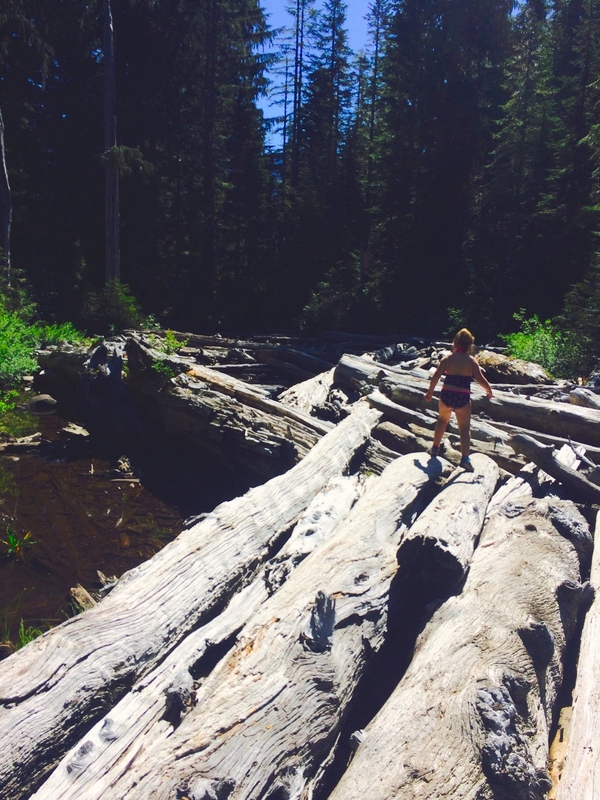 Get there: This trail is out of Granite Falls up the Mountain Loop. The trailhead is on the highway directly across from the Green Mountain Road about seven miles from town. The way quickly brings you into an old growth forest and before you know it, you reach Lake Evan. Do not settle, continue to the more inviting Boardman which has plenty of room and some older campsites. Get there: Taking the Mountain Loop Highway past Verlot about four and half miles, turn right onto schweitzer Creek Road, FS Rd 4020. stay left at the only junction and the trailhead is 5 miles from the highway on the left. The trail is very short, but also hasn't seen a lot of maintenance. With this is mind, you will find excess mud and water on the route. The lake is 23 acres and has a great forest around it. Get there - Take the Mountain Loop Highway 12 miles from Granite Falls until you take a left on Deer Creek Road. Just after 4 miles the trailhead is on the left. The renowned Ice Caves!! The trail has a huge parking lot and starts out paved. After a bridge over the Stiliguamish River, the trail turns gravel and soon you are at the base of Big Four. This is one of the most popular hikes in the state. Get there: From Granite Falls take the Mountain Loop all the way to the parking lot, 24 miles from town. This is mostly an old road, but you soon forget as you realize how high the ridge tops above you are from the valley floor that you are walking in. After the first mile the road crosses the South Fork Sauk River. This is a great spot for the kids to feel like they have come to a stopping point. The river begs you to at least dip your feet in, if not more. For those with older kids, the trail/road continues another three miles to the old mining town. On the way notice that you are on the path of an old railway by the two very straight one mile sections. You finally cross the river into town and try to find as many relics from the olden days that you can. If you do hike all the way into town, do not miss Sunday Falls just before the trailhead to Silver Lake. The other major trail out of the town is Glacier Basin and it too has an amazing waterfall that is very easy to get to! The best way to experience this hike is actually by bicycle. Coast your way back to the trailhead in 30-40 minutes. Get there: Drive the Mountain Loop out of Granite Falls all the way to the point that it turns from pavement into a gravel road. The trailhead is right there at the gated road on the right. This is a simple trail that used to be a lot longer before the Sauk River cut the trail short. There is still a great meander to an old beaver pond. Just past this point, the trail enters an old growth forest and eventually you find the slide. 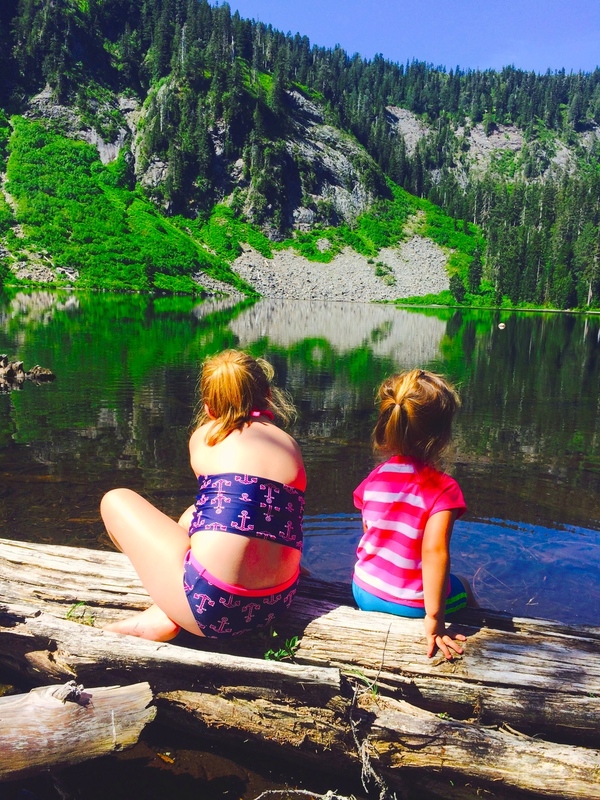 The kids will enjoy this hike just to get out! Get there: Drive to Darrington and turn left at the stop sign, going around the backside of the Mountain Loop. About nine miles, just over the Sauk River bridge, the trailhead parking lot is on the right. This is a very flat hike that can be started up river or down, having two trailheads. This is a great hike with many spots to see the Sauk River in its most majestic spots. Families love this trail. Get there: Drive to Darrington and turn left at the stop sign, going around the backside of the Mountain Loop. Not quite four miles from the turn you see the first trailhead on the right and the second trailhead is just under two miles from there. This has everything for your checklist! As you start the trail on a very old wagon route, you can hear the roar of Boulder River down below. The trail stays level with one major uphill portion nearing the river. Here the evidence of a wagon route disappears, and in this last portion of the hike leading up to the falls, you get a more standard trail. The falls is about 150 feet, and there are old growth trees above you if you look uphill. Amazing for all ages! Continue up the old path that was the original route to a lookout on Three Fingers Mountain. The water and trees continue to amaze as you follow along until the trail drops a bit and stops at a campsite next to the river. Get there: Drive out of Arlington on Highway 530 towards Darrington. Just after the now historic mudslide area turn right on French Creek Road (milepost 41). The trailhead is at the end of this gravel road. At a quarter mile, through an old clear cut and then into a bigger forrest, you come to the junction with Dock Butte Trail. This trail is a bit up and down for 1.5 miles to a viewpoint of Mount Baker and Shuksan. 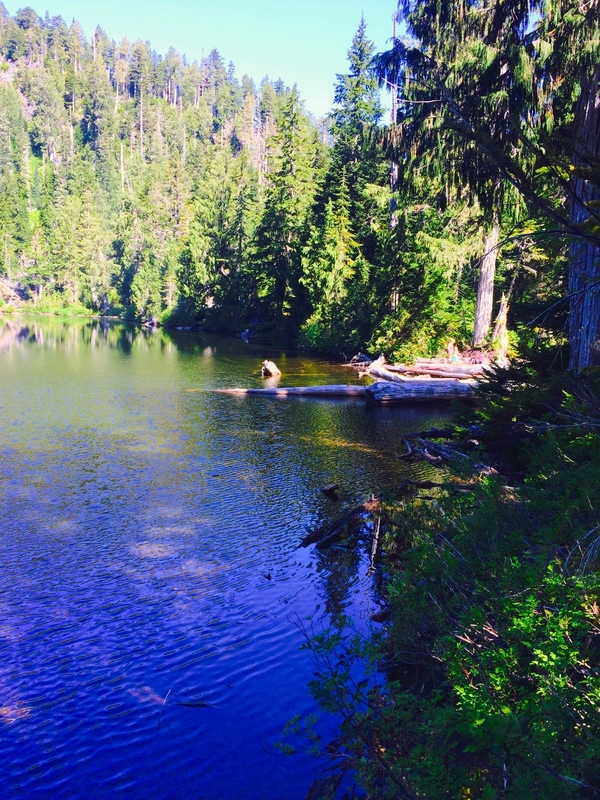 The Blue Lake Trail continues left for a half mile where you drop a bit to its shoreline. Get there: Take Highway 20 east from I-5 passing through Sedro-Woolley to the Baker Lake Highway just beyond milepost 82. Turn left after about 14 miles onto FS rd 11, veering left at almost two miles. At seven miles stay left again on FS road 1230 and follow it to the trailhead at the end of this road. Starting out through a washed out campground and crossing a rocky, seasonal creek, the trail enters a dense forest. Passing a few benches along the way, at about one mile, you reach a viewpoint and behold Colonial Mountain. There are on again off again views before reaching a pond and then eventually the trail's end, with several views of the surrounding mountains and Diablo Lake. The way is very gradual and the backcountry benches are well placed. Get there: From I-5 take Highway 20 east past Marblemount about 24 miles and turn right at the Colonial Creek Campground near milepost 130. The trailhead is at the campground entrance. This has a bit more uphill than most of the other hikes on this list. Though there is a lake at the end, giving the little legs some inspiration. This is a very well placed trail that weaves through beautiful forests to a loop around Fragrance Lake. After the first mile there is a short spur trail to a viewpoint overlooking the Puget Sound. Because of the more uphill, this trail should be considered for a bit older age kids (6-7). Get there: Take I-5 to Burlington and exit onto Chukanut Drive. Follow Chukanut to Larabee State Park and find trailhead parking on the right side of the road. This 200 acre park has a wonderful five mile loop trail that winds around the outside of a two mile paved loop that you can drive. The high point is only ten feet and there are also cross trails that help connect the campground to the trail system. Views include the San Juan Islands and wildlife in or out of the water. There is no trail within this state park that cannot be done with kids. Do not miss Goose Rock for views up high and most of the trails have views of the water. The easiest way to explore the extensive system of trails is to ask the Rangers at the gates for a complimentary map. Get there: Take I-5 and exit west on Highway 20. Follow it to the stoplight on the other side of Deception Pass Bridge. Turn right at the light and talk to the Rangers at the booth there.